Watch You Drown is a diverse collection of short fiction. These are primarily crime tales although the story Sidewinder, perhaps my favourite, is very much a Sci-Fi tale. One of the biggest criticisms in a collection such as this is that the stories are too short. To spin that into a positive - you want these tales to be longer because Rhatigan creates such solid characters and such gripping scenarios, that you really do want to see what happens next. You want to explore more of the worlds the author creates. 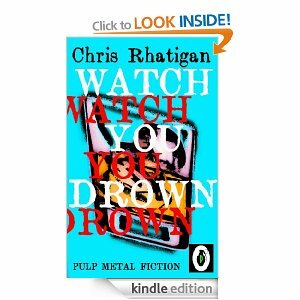 Rhatigan's wry and pithy observations give his tales three dimensions and his fiction takes us to dark and fascinating places. An accomplished and enjoyable collection that will engage you with every twist and turn. after dark, when it's your shift on Neighborhood Watch. losers, hitters, thieves, hookers, savage bounty hunters hunting alien killing machines and charming burglars facing irate homeowners in the middle of the night. Like I said, jazz. Low and slow or fast and terrifying Watch You Drown plays like climbing brass with back alley overtones. Cool.